Nikola Tesla's accomplishments are today still underrated. Imagine being stricken with blinding flashes of light that envelop your mind and fill your brain, but in those blinding flashes is contained a vision that solves a problem that has been racking your brain, or the idea for an invention. Such was the inspiration for Nikola Tesla, best known for his work with alternating current electricity. He gained inspiration from those visions, which propelled him to be a prolific inventor. Like many great minds in scientific history, he had a somewhat tortured life. 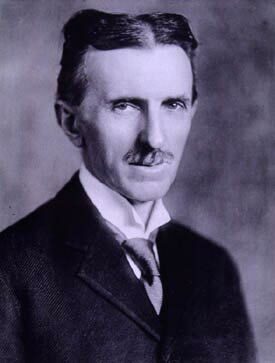 Tesla was born in 1856 to Serbian parents in what is now Croatia. Tesla finished high school early, in three years instead of four. He studied electrical engineering at the Austrian Polytechnic in Graz, where he first studied alternating currents, but left in his third year and did not receive a degree. Tesla eventually moved to the United States to work with Thomas Edison, but the two eventually became rivals, with Edison championing direct current as opposed to Tesla's alternating current, in what became known as the "War of Currents." Tesla had left Edison to work for George Westinghouse, who saw the value in Tesla's inventions. The "war" culminated in the Columbian Exposition (the Chicago World's Fair) in 1893, when it was determined that Tesla's alternating current via Westinghouse would power the fair, as opposed to Edison's more pricey and bulky direct current through General Electric Company. Tesla's accomplishments are today still underrated. While Edison is credited with being the inventor of the light bulb, it is Tesla's alternating current that powers much of the world. Likewise, while Guglielmo Marconi is popularly credited with inventing the radio, Tesla's work was instrumental in its development. In fact, the Supreme Court overturned Marconi's patent in 1943, crediting Tesla with being the first to patent radio technology. Tesla used his eponymous Tesla coil, a high frequency transformer, as the basis for experiments in electrical lighting, x-rays, phosphorescence, electrotherapy, and the wireless transmission of electric energy. He is credited with inventing the fluorescent bulb and neon light, as well as the spark plug for internal combustion engines. He provided the basis for radar, the electron microscope, and microwave ovens. He even dabbled in robotics, far ahead of his time. Tesla read voraciously and is reported to have had an eidetic memory, going beyond the visual recall of a photographic memory. He is said to have envisioned complete diagrams of inventions, sometimes working only from memory, not bothering to draw them. He spoke seven languages. Like many great scientific minds, he required little sleep, and is reported once to have worked 84 hours straight without stopping to eat or rest. With brilliance often comes eccentricity. Tesla had obsessive compulsive disorder, which compelled him to do things in threes, including only inhabiting a hotel room that was divisible by the number three. He had an obsession with pigeons and an aversion to women wearing earrings, contributing to his reputation as eccentric. He suffered a nervous breakdown when he was young, and may have had dementia before he died. He never married. After his death at the age of 86 alone in the New York hotel room he called his home, much of his work was confiscated by the U.S. government and declared "top secret," in part because for years Tesla had worked on a "death ray" that was intended to be a "superweapon" to end all wars. Years later, much of his work was released, and it can be seen in the Nikola Tesla Museum in Belgrade, which holds more than 160,000 original documents and over 1,000 plans and drawings of his work.